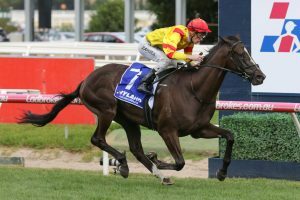 Former Darren Weir trained Hawkshot claimed the $200,000 Autumn Stakes (1400m) in a canter at Caulfield on Saturday. Now with the Lindsay Park team, the three-year-old was installed as a $6.50 chance hoping to improve on a strong runner-up performance at Moonee Valley a fortnight ago. Hawkshot dictated the pace early as jockey Mark Zahra opted to go forward, and by the 200m mark, the rest of the field were left to wonder what went wrong. Hawkshot, above, has firmed into single digits ahead of next month’s Australian Guineas at Flemington. Photo Credit: Ultimate Racing Photos. Meanwhile, Hawkshot cemented himself as a serious Australian Guineas (1600m) chance at Flemington on March 2, and has since firmed from a whopping $41 into $9.00 with Ladbrokes. “I think it was that early prep that got him to settle, but once you get him to the front, he’ll never lose” Zahra said after the race. It appears the mile should suit the son of Fiorente nicely, while trainer Ben Hayes left all the credit for Zahra. “Mark knew the horse very well, just let him roll to the front, he dictated and kicked to the corner, couldn’t have been more impressive” Hayes said. Hawkshot will have his work cut out for him alongside classy Group 1 winners like The Autumn Sun and Extra Brut. Hayes thinks fitness is on his side however, and still feels excited by Hawkshot’s chances.